Following his older brothers and Palmyra graduates Tim and James, Liam Brett is coming of a record season where he recorded 15 shutouts for the Panthers. Liam Brett prepares to kick the ball down the field during Palmyra High School boys’ soccer’s 4–1 win over Pennsauken Township High School last Wednesday. Brett is the third goalie from his family to play for the Panthers in a little more than decade, following his older brothers Tim and James. For most of the past decade, the Brett brothers have had a lock on the goalkeeper position for Palmyra High School boys soccer. Brothers Tim, James and Liam Brett have all starred for the Panthers in net since the late 2000s. Tim graduated from Palmyra in 2010 after leading the Panthers to a state championship in 2009. A few years later, James, a 2015 graduate, set the program’s record for career shutouts during an outstanding four-year career. Now Liam is making his mark on the boys soccer program. 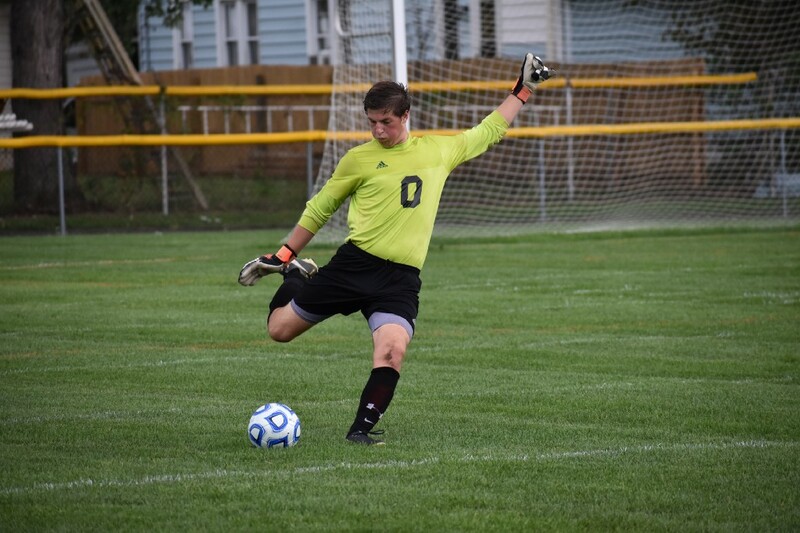 In his first two years as a starter, Liam recorded 23 shutouts, made more than 200 saves and guided the Panthers to back-to-back appearances in the sectional finals. Liam admits his two older brothers definitely had an effect on him choosing to be a goalkeeper. He recalls watching Tim play in net for the Panthers during their 2009 state championship season and hoping he would be able to play in net for Palmyra when he reached high school. Liam said being a goalkeeper just came natural to him when he began playing in net while playing youth soccer. He also believes following in the footsteps of Tim and James has its benefits. Papenberg described Liam’s personality as a mix of Tim and James. Papenberg praised Liam’s leadership and how much he has matured since he took over the starting job as a sophomore in 2016. Liam has embraced his role as a leader and recognizes his vision of the field is a benefit to the team’s play up front. “If you tell them what you see, if they can see through what you’re telling them, it helps the whole team play better,” he said. Liam admitted he sometimes faces expectations to perform just as his brothers have in the past. However, he is concentrating more on making his own mark. Liam was able to do that last season when he set the program’s single-season record for shutouts with 15. Liam’s numbers have continued to be solid early on in 2018. In his first three games, Liam has made 11 saves and has allowed only one goal. He earned a shutout on Sept. 8 against Pemberton Township High School. Liam is planning to follow in his brothers’ footsteps and play soccer in college. Tim played at Richard Stockton University and James manned the net for Rutgers University-Camden. When looking back at all of the contributions of the Brett brothers in net, Papenberg simply said, all three of them were great goalkeepers. When asked which brother was the best, however, Papenberg couldn’t give an answer. “The argument for who is best will have to end at the Brett household at the dining room table,” he said with a laugh.